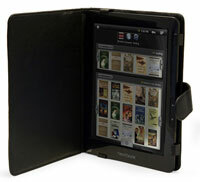 The NextBook Next3 is among the growing ranks of Android tablets marketed as ereaders. It ties-in with the Borders ebooks store but does not use the Borders Android reading app, it has its own reading app for additional format support and for ebooks with Adobe DRM. The Next3 runs Android 2.1 and is open to installing 3rd party Android apps, granting access to several other reading apps and news apps—Kindle, Nook, New York Times, Aldiko, OverDrive, to name a few. What jumps out about the Next3 at first is that it is thinner and lighter than I'd expected. Even though it has a larger 8.4" display, it weighs slightly less than 7" ereaders like the Pandigital Novel, PocketBook IQ, and Cruz Tablet. 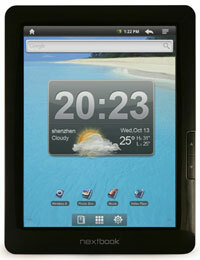 It has a sleek glossy-black finish and a resistive touchscreen. A cover is included as well as a small stylus that's humorously reminiscent of an old rabbit-ears antenna. The touchscreen works great so the stylus really isn't needed and removing it makes the cover fit better. The Next3 doesn't have any proper Android buttons. Instead there are two page-turn buttons that also double as Menu and Home buttons for long-press. There are on-screen buttons for these too, along with Back, on the upper corners of the task bar. Unlike most Android ereaders, the Next3 doesn't have any volume buttons. This takes some getting used to. The built-in apps for Music and Video have on-screen buttons for volume but many 3rd party apps don't. You have to leave the app and go to Settings - Sound & Display - Media Volume to adjust it. The Next3 doesn't come with a ton of apps pre-installed. There's the e-reading app, web browser, a weather widget, apps for video, music, photos, there's a calculator, YouTube video player, app store, file manager, email, and a few others. Learning how to install Android apps is one of the first things any Next3 owner needs to do. The Next3's built-in reading app supports EPUB, PDF, TXT, FB2, RTF, and PDB formats, including ebooks with Adobe DRM. You can purchase ebooks by tapping the Borders icon. Once registering it with your Adobe Digital Editions account, this directs the web browser to Kobo's mobile site, but with Borders' branding (Borders' ebook store is powered by Kobo). The NextBook app works well enough but lacks any advanced features. I'd recommend installing Aldiko 2.0 instead. It's free and supports EPUB and PDF and Adobe DRM—Borders ebooks will work with it too—and it has a lot more features and customizing options. Features for the NextBook app include adding bookmarks, jumping to a page number or chapter with the TOC, adjusting text size (5 choices), auto-adjust to portrait and landscape modes, and you can set the pages to auto-turn at 15, 30, or 60 seconds. Turn pages by swiping or by using the page-turn buttons. It uses animated page-turns. The NextBook's app supports PDF files with or without DRM. The app is pretty basic but works well for viewing and zooming in on PDF files, the larger screen helps. It has the same exact features for PDFs mentioned above as it does for ebooks. The one difference being the 5 zoom settings go by percentage from 100 - 200%. Since the Next3 runs Android, there are other options for PDFs. The free Adobe Reader App is one. It does not have many features either but works well for viewing PDFs and also has reflow and an email as attachment feature that the built-in app does not. The Next3's 8.4" screen size is somewhat unique for current devices on the market. The screen tech, however, isn't. It's TFT LCD and the resolution is 800 x 600. The pixel density isn't great for the screen size but it's not bad either. For size comparisons, here's the Next3 alongside the smaller PocketBook IQ and Nook Color. The Next3 comes with enough memory to install a few dozen apps but there isn't very much memory for file storage, just 2GB, half of which is already occupied. The Next3 definitely needs a memory card. It has an SD card slot and supports cards up to 8GB. There are a few odd things about the battery. First you have to be sure to plug the charger into the correct port; the headphone jack is right next to the charging port and both are the same exact size. Battery life is rated at about 5.5 to 7 hours, depending on a number of factors. That seems about accurate but I've noticed that leaving it on Standby drains the battery noticeably faster. The battery charge indicator doesn't seem very accurate either. One minute it's green and showing half a charge and the next minute it's giving the low warning. Once the battery gets below 15% - 20% the device will not turn on unless it's plugged in. Another annoyance with the battery is that there's no charging indicator, no light to let you know when it is fully charged. The only way to see if the battery is fully charged is to boot the device up and see if the little green battery icon has stopped flashing or not. Unlike a lot of other budget tablets that I've tested, the Next3 plays videos smoothly and supports several formats (listed at the bottom of this page). I tried my usual MP4 and M4V test videos and some played really well while others would occasionally flicker every now and then. The same thing occurs with some YouTube videos. Here's an article to learn how to setup videos using free software. The article was written for the Nook Color but the same steps apply for the NextBook, just make sure to use the proper formats and settings listed in the Next3's manual and on the box. The Next3 comes with a YouTube Player app, but it isn't the actual YouTube app. It plays YouTube videos in low quality and seems to only include some videos from YouTube. Installing this YouTube app works much better because you can play in higher quality and running searches includes all YouTube videos, not just a few. The Next3 has WiFi but no 3G. Once you enter your router's security password, WiFi will automatically connect whenever you turn the device on. There's a shortcut widget to the right of the homescreen for quickly turning WiFi on and off. WiFi remains on during Standby if you don't turn it off, leading to the battery losing its charge faster. 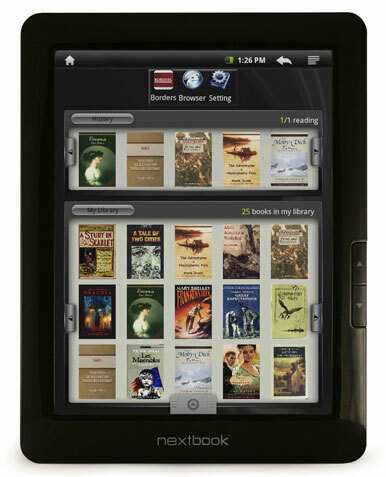 Like similar devices, Android ereaders are great for browsing the internet, shopping for ebooks, downloading free ebooks, sending and receiving email, streaming radio, and so on. Since the Next3 runs Android 2.1 it does not support Flash, however. That's for Android 2.2 and higher. Games are another thing Android ereaders are good for. There are thousands of games available and a lot of them will work on the Next3. But it shouldn't be purchased for heavy gaming. 3D games and complex games will not run on it. I tried Angry Birds, a racing game, an NES emulator and all would install but none would work properly. Card games, Jewels, chess, sudoku—those types of games generally work fine, provided they go fullscreen. When I first started this review, the Next3 was selling for $199 from Amazon and a few other websites. As I wrap up this review I notice that the price has jumped considerably, even as high as $299. It's amazing how something like that can completely change the tone of a review. At $199 I feel comfortable recommending the Next3 given it feature-set and usability, especially considering most similar devices like the 9" Pandigital Novel and the smaller 7" PocketBook IQ, Cruz Tablet, and Pandigital Novels all sell in the same price category of around $150 - $200. But at $299? I would not recommend it for that. Sure it comes with a cover and is larger than the 7-inchers mentioned above, but at that price you can get a device with better specs than the Next3. Even at $250 the Nook Color has a faster processor, much better screen quality (although smaller), hacks for advanced app support, increased speed, Android upgrades, and so on. The good news is the Next3 can't stay at that price for long with the Next4 scheduled to launch in Q2 2011 for $349 with a 10" capacitive touchscreen, Android 2.2, and 8GB internal memory. Compared to that and other Android devices, the Next3 is much better suited for a sub-$220 price. In that price category it becomes one of the better Android tablets/ereaders to choose from. 8.4-inch TFT LCD touchscreen, 800 x 600 resolution. Support for 3rd party Android apps. CPU based on ARM926 EJ (dual-core), 600Mhz. 2GB memory, 256MB for apps, SD card slot for cards up to 8GB. Web browser, email, audio player, video player, image viewer, calculator, Borders ebooks, plus other apps. Built-in speakers and 3.5mm headphone jack. G-sensor automatically rotates screen orientation. Comes with AC charger, USB cable, stylus, and cover. Dimensions: 212.8 x 161.4 x 11.4mm. Weight: 17.2 ounces (489 grams). Image formats: JPEG, BMP, PNG, and GIF. Audio formats: MP3, WMA, WAV, OGG, FLAC, APE, AAC. Video formats: 3GP, MP4, AVI, MOV, WMV, MKV, FLV, RM/RMVB. Supported ebook formats: Adobe DRM, EPUB, PDF, TXT, FB2, RTF, PDB.